The NZ Transport Agency (NZTA) is encouraging motorists heading away for Labour Weekend to plan ahead to stay safe and avoid delays. One of the easiest and most accurate sources of information on expected travel patterns is the Transport Agency's Hotspots maps. Based on previous Labour weekends, the data shows areas and times most likely to be congested. One of the biggest pinch points is on State Highway 1 between Puhoi and Kawakawa, and at Warkworth. Traffic will start building on Friday afternoon and continue through until Saturday morning as people head away. It will build again on Monday from mid-morning as everyone heads home. It's also particularly busy heading south out of Auckland on SH1 from midday on Friday until around 8pm and then again on Saturday from about 9am. Heading north to Auckland on Monday, traffic gets busy from lunchtime through until around 7pm. The State Highway 1 and State Highway 2 Interchange from Coromandel can also get congested. "If you can travel outside of these busiest times it will help reduce your chances of being stuck in a queue and help keep traffic moving. If you do have to travel then, please allow plenty of time to get to your destination," says Harry Wilson, the Transport Agency's Safety Director. "When you combine the higher number of cars on the road, tiredness and driving on unfamiliar roads it can create stressful driving situations which can in turn lead to mistakes." "There's a lot of construction and maintenance happening on state highways across Auckland and Northland and we ask motorists to slow down through these work areas. 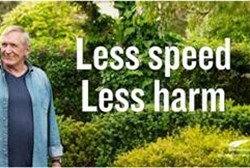 Even when there's not obvious work taking place there are hazards that mean you should keep within the reduced speed limit to keep yourselves, your families and other road users safe. It also reduces damage to what can be newly surfaced or repaired roads."